You can't put it into words, but something is happening to you. Your stomach churns, your heart aches, and the tension in your marriage is making you feel weary and a little crazy. The constant criticism, disrespect, cruelty, deceit, and gross indifference are eroding your confidence and breaking your spirit. Trying harder to be a perfect fantasy wife won't help fix what's wrong your marriage. Discover instead how you can initiate effective changes to stop the cycle of destruction and restore hope for the future. "Women in an emotionally abusive marriage do not need another book on how to have a good marriage; those books rub salt in raw wounds. 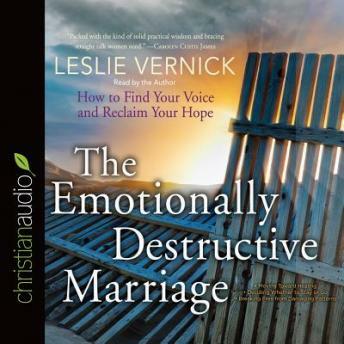 No, they desperately need this book so that they can diagnose just how bad their marriage is and then, with Leslie's clear expertise, develop a plan that will either begin to turn their marriage around...or give them a wise route of escape." There should be a slower paced option because the narrator reads too fast. Wonderful book. Teaches biblical boundaries in marriage torn by emotional, verbal, and physical abuse. Please get this for yourself or a friend!!! If it's too fast go into your device settings and slow the speech down.